Amex Membership Rewards is offering a 25% transfer bonus to Flying Blue. A good deal? It well can be if you’re interested in Europe or/and Israel. Flying Blue is famous for its great redemption rates between North America and Israel in coach. 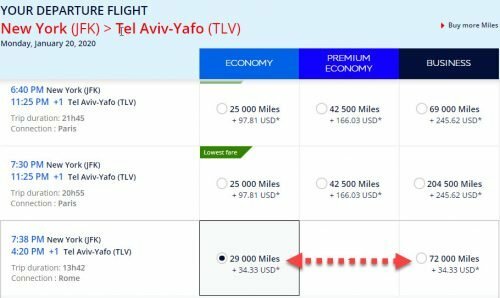 For whatever reason, Flying Blue puts Israel and North Africa in Europe and charges accordingly — only 25,000 miles per OW in Economy and 553,000-72,000 miles in Business Class. 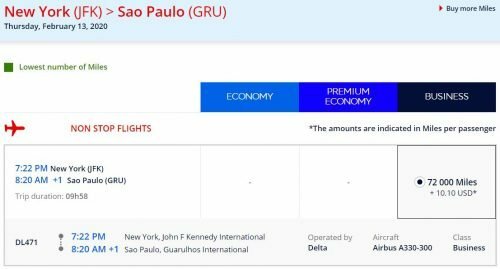 Imagine paying 25,000 miles for flying a nonstop on Delta in a corresponding class of service for only 20,000 Amex points with the 25% bonus. Sound like a dream? Well, you can wake up now, because I haven’t found one flight on Delta metal in either class. 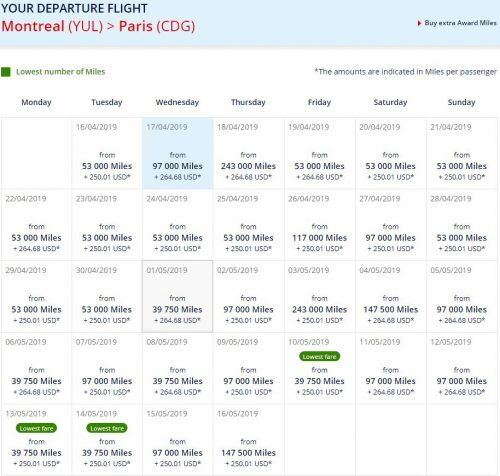 And while award space on connecting flights is not that bad 10-12 months in advance, you will, in most cases, pay fuel surcharges. The YQ and taxes will run you at least ~$87 in Economy, and ~$250 in Business Class. BUT you should never take the first Flying Blue search screen at face value. They always push Air France or KLM first, so you actually have to click through even if the first price they throw at you is atrocious. Or, if you value your time and sanity, just use Expert Flyer. 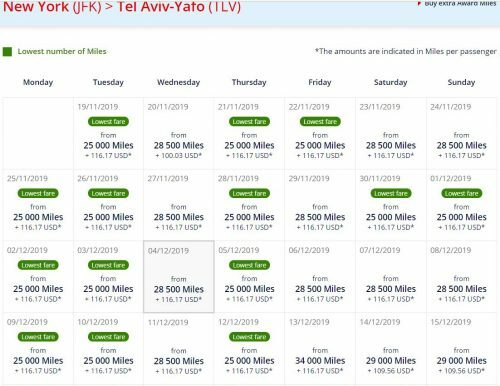 Having said that, finding a nonstop Delta flight to Tel Aviv is very hard indeed, so, realistically speaking, you’re usually limited to connecting flights anyway. You might feel that $250 is not that bad considering the low mileage price, and you’re right, it isn’t. but it’s still $250. Can you do better? 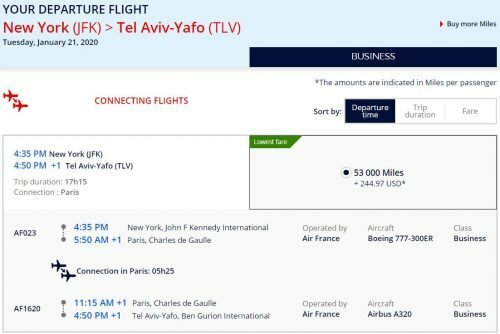 While finding a nonstop Delta flight to Tel Aviv is a gargantuan task, you should aim at a Delta Connecting flight to Europe. Here is why. So, you’re paying 4,000 miles more, but with this the bigger portion of your fuel surcharge (in our case $60+) disappears. It’s not that huge of a difference in an Economy Class cabin, but try Business Class, and you’re saving $200+! Not too shabby, huh? It’s not that simple, however. Yes, in Business Class, you are paying a much lower cash outlay, but you’ll also pay more in miles. Here are 2 round trip redemptions in Business Class for the sake of direct comparison. The first is a Delta round-trip flight across the pond with a connection in Rome and the second leg on Alitalia. Do you value 38,000 Flying Blue miles more than $406? Or here is a better question: do you value $406 more than 31,000 Amex points (the difference in Amex points with the 25% Amex bonus)? all things being equal, it’s your choice whether you’re willing to buy 31,000 points for $406. Because this is exactly what you do when you choose an Air France flight instead of Delta. Yes, Flying Blue is well known for its discounted promo awards on Air France and KML. If theses awards worked for you in the past, you might want to take advantage of this 25% Amex bonus, even speculatively. Keep in mind the fuel surcharges of around $250 one way, though. This month, 2 major promos you might be interested in are Toronto and Montreal to Europe. 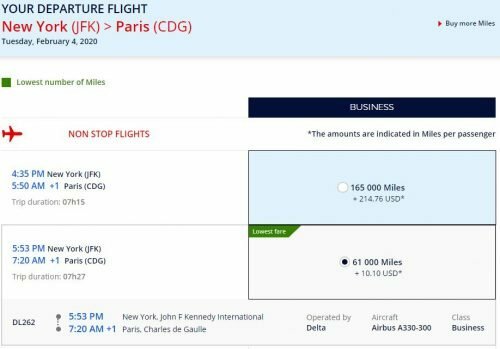 The price will vary, but you can fly from Montreal to Paris for 39,750 miles plus $250-$260 for taxes and fees. Now let’s calculate how many Amex points we would need to get 40,000 Flying Blue miles (taking into account the Amex transfer bonus). The answer is 32,000 Amex points. 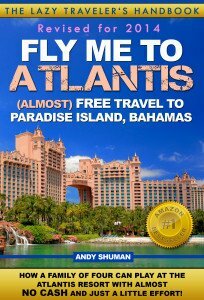 Or 64,000 Amex points for the round trip. Wow! As much as I hate fuel surcharges (and I really do hate fuel surcharges), I have to admit this is a pretty good value. When was the last time you’ve seen a Business Class TATL under 80K? Note that availability for May and June is pretty decent so far, but I can’t imagine it’ll last, so don’t waste your time if you’re interested! And here is another Flying Blue Unicorn! Of course, for everyone who’s not a Canadian, you’ll need a positioning flight to either Toronto or Montreal to double dip into the Amex transfer bonus and the above-mentioned Flying Blue Promo Award. And the fuel surcharge, albeit not terribly high, isn’t too comforting. But what if I told you there are more values out there? 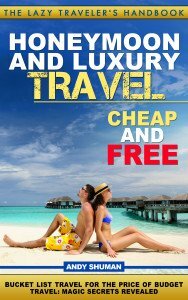 The cheap rates to Europe start at 53,000 from the East Coast and go up from there. I wish I could figure out how Flying Blue is pricing their award redemptions, but I don’t see the rhyme or reason. Sometimes, longer flights cost more (but not always); connecting flights often cost more, but (again) not always. Just check the Flying Blue Miles Calculator and go from there, but it can be slightly inaccurate too. Nevertheless, here are some datapoints. 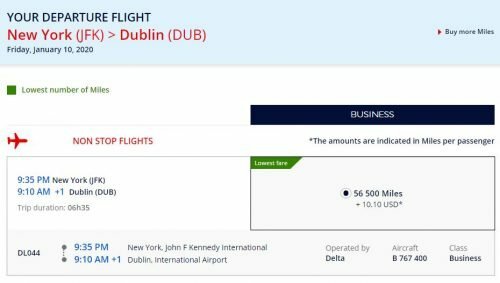 A nonstop flight between New York and Dublin costs 56,500 miles on Delta (even though the Flying Blue calculator gives 53,000, this is still a great price!). With the 25% transfer bonus, you’re looking at 46,000 Amex points one way or 91,000 points per round trip and ZERO fuel surcharges. Nonstop New York to Madrid is 58,000 miles on Delta (even though the Flying Blue calculator gives 59,500, I’m not complaining 🙂 ). With the 25% transfer bonus, you’re looking at 47,000 Amex points one way or 93,000 points per round trip and ZERO fuel surcharges. Nonstop New York to Paris (or Brussels or Amsterdam) is 61,000 miles on Delta (even though the Flying Blue calculator gives 63,000 🙂 ). With the 25% transfer bonus you’re looking at 49,000 Amex points one way or 98,000 points per round trip and ZERO fuel surcharges. Unfortunately, as you move west, flying to Europe becomes more expensive. 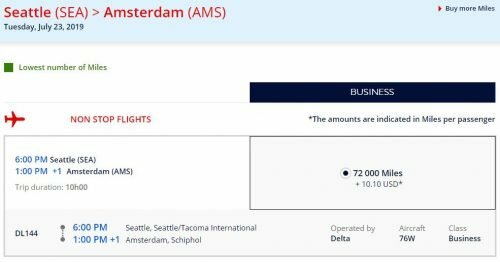 Paris from Salt Lake City or Amsterdam from Seattle in Business will run you 72,000 miles (60,000 Amex miles with the 25% transfer bonus). Not bad, but hardly a Unicorn, or even a bargain. Have you heard about Air Europa? The last thing I heard about that Spanish airline was that they added heavy fuel surcharges fashioned after British Airways, so I stopped even looking in their direction. 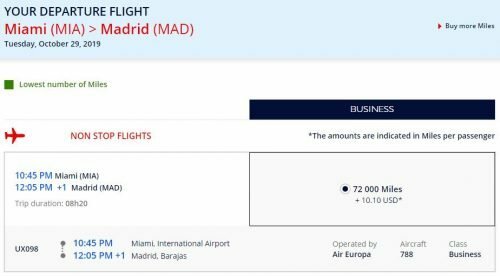 It seems Flying Blue doesn’t add any surcharges to Air Europa flights, so you can fly nonstop from Miami to Madrid for 72,000 miles (60,000 Amex Membership Rewards miles with the bonus). 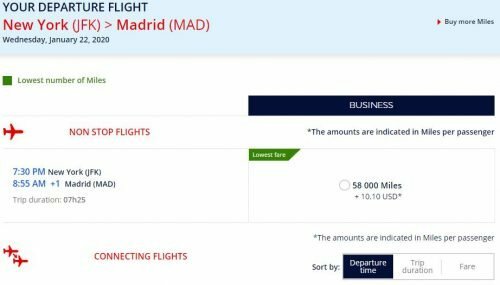 Delta doesn’t fly nonstop to Europe from Miami, so this might be your only option, and not a bad one to avoid connecting flights and YQ. Here are some other decent, but not great, Flying Blue options. Just to be clear: they are decent only if you count the Amex 25% transfer bonus. 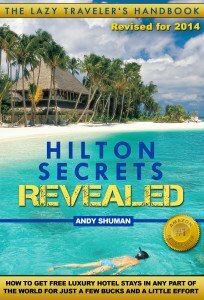 Should you transfer Amex points to Flying Blue with the current 25% bonus? That depends on several factors. Flights between North America and Europe/Israel/North Africa are the strongest feature of Flying Blue, but finding ones with no/low fuel surcharges is difficult. 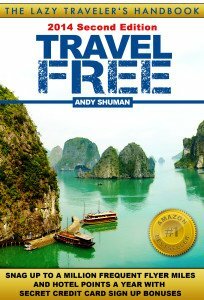 Redemption levels between the U.S. and other regions are nothing to write home about (Asia would be super-expensive even with the bonus). Getting to Israel for 25K/53K is pretty awesome, especially with the bonus, both in Economy and Business Class. 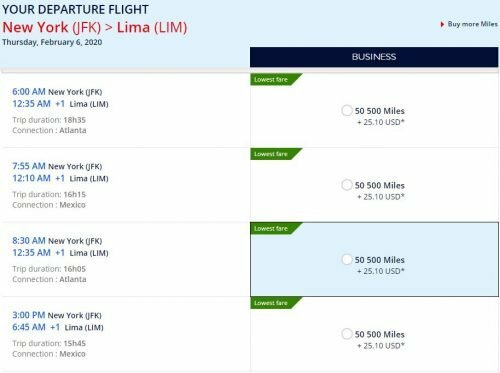 If you’re flying from the East Coast, you can derive a Unicorn-grade value out of the current bonus, coupled with Delta’s no fuel surcharges redemptions (from 46,000 Amex points). 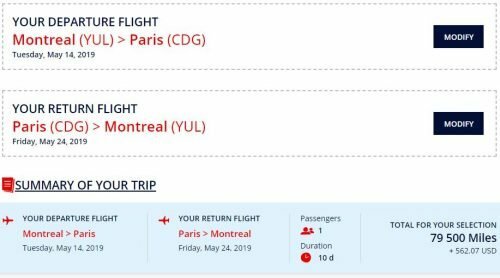 If you’re planning on flying to Europe from Montreal or Toronto between Apr 30 and Jun 29, 2019, definitely double dip with the 25% Amex bonus and 25% Promo Awards. Flights start at 32,000 Amex points. This is an incredible redemption value for Business Class despite the moderately high fuel surcharge. Well, that’s about it. Have I missed any other bargains? Are you going to transfer your Amex points to Flying Blue? Thank you. 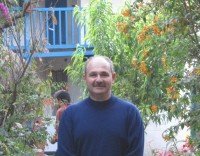 This is one of the very few blogs to visit when you want to learn about the tricks. “Unicorns” is a great term for this! Great work as always. Love the material you’ve been putting out in the award realm. Just one typo at the end you said “as we speak *flying blue* has a 15%…” when you meant Amex.